Bacterial rhomboid protease GlpG. The bacterial membrane is shown schematically in gray. Proteases, enzymes that cut protein chains, come in many shapes and sizes. The most familiar proteases, like trypsin and pepsin, are machines of destruction used to digest proteins in our diet. However, most of the proteases in our cells are used in a more delicate task. They regulate the action of other proteins by making specific cuts in their protein targets. In some cases, these cuts can activate the proteins, in other cases, they permanently destroy them. In either case, the change is quick and permanent, turning the target protein "on" or "off". For many years, proteases were seen as small soluble enzymes, largely because digestive proteases are plentiful and easy to study. Now, however, proteases are known to come in many shapes and sizes, ranging from small, stable digestive enzymes to huge proteasomes that clean up obsolete proteins inside cells. In the past decade or so, an entirely new type of protease has been discovered: proteases that are found inside membranes, where they cut up other membrane proteins. The first intramembrane serine protease was discovered in a mutant fruit fly, named "rhomboid" because of its oddly-shaped head. The protease regulates a growth receptor that controls this shape, so it was named after the fly mutation, and is now called a rhomboid protease. 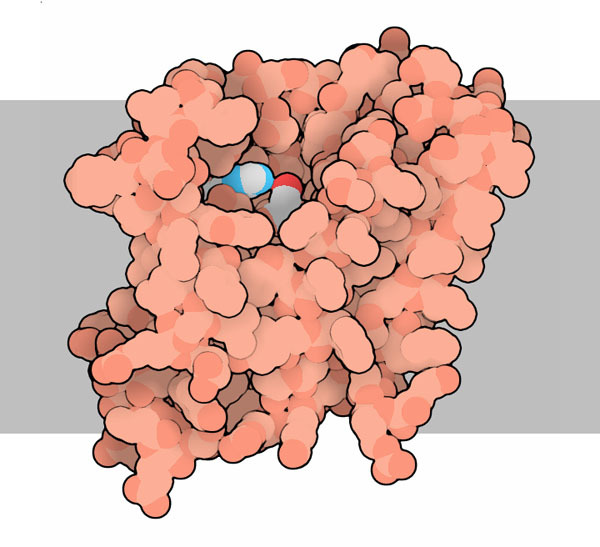 Ironically, the protease is also roughly shaped like a rhombus floating in the cell membrane, as least from some angles. The protease shown here is GlpG, a bacterial rhomboid protease, from PDB entries 2ic8 , 2irv and 2nrf (shown here). Site-2 protease (left) and preflagellin peptidase FlaK (right). Researchers have also found other types of intramembrane proteases, which use many of the familiar catalytic mechanisms found in soluble proteases. The rhomboid proteases use a reactive serine-histidine pair, similar to the active site in the serine proteases like trypsin and chymotrypsin. The site-2 family of proteases, like the bacterial protease shown here on the left from PDB entry 3b4r , use a zinc ion, similar to soluble metalloproteinases like carboxypeptidase. Finally, acid proteases have also been found in membranes, such as the preflagellin peptidase FlaK, shown here on the right from PDB entry 3s0x , and the huge protease complex gamma-secretase, which plays an important role in the development of Alzheimer's disease. Intramembrane proteases perform a tricky job. They need to sit comfortably inside a hydrophobic membrane, but they also need to use water and water-binding amino acids to perform their reaction. They do this by having a flexible loop that covers the active site, allowing their targets and water to enter. Three structures reveal some of this flexibility, although many controversies still remain, since study of membrane proteins requires use of artificial methods to stabilize the proteins outside of membranes. PDB entry 2ic8 (left) shows a tightly-closed form and 2nrf (center) shows a wide-open form. PDB entry 2xow (right) shows the protein closed around an inhibitor. Click on the images here to compare the structures in an interactive Jmol. PDB entry 3b4r includes two copies of the protein, one in a closed form and one in an open form. You can use the "Structure Comparison" tool to compare these two forms. Membrane proteins typically have a band of hydrophobic amino acids on the outside, which interacts with the surrounding membrane. To take a look at this, go to the PDB page for any of the rhomboid proteases (or any other membrane-spanning protein) and then choose a CPK style and hydrophobicity color in your favorite 3D viewing program. Y. Ha (2009) Structure and mechanism of intramembrane protease. Seminars in Cell and Developmental Biology 20, 240-250. M. Freeman (2008) Rhomboid proteases and their biological functions. Annual Review of Genetics 42, 191-210. S. Urban and Y. Shi (2008) Core principles of intramembrane proteolysis: comparison of rhomboid and site-2 family proteases. Current Opinion in Structural Biology 18, 432-441.